Now that the Super Bowl is over, the early spring home selling season has officially begun. There’s no time like the present to start decluttering and transforming your lived-in home into a show-worthy property to make a positive impression on potential buyers. That means attending to the most important details that will create mass buyer appeal and increase your home’s value. Repair any cracks in the driveway and walkway, power wash steps and railings if necessary. Ensure that you have a prominent, working doorbell and the front door is freshly painted. Removing the carpet to reveal hardwood floors, adding a coat of neutral paint and updating lighting, window treatments and accessories gives a fresh, bright and updated look to the room. Remove anything that will distract buyers from seeing your property, including personal collections (yes, the sports memorabilia room has to go! ), a wall of family photos, newspapers, books and magazines, etc. 3. Refresh walls, rugs and windows treatments. When was the last time your seller painted? Are their imperfections or scratches on the walls? Is the current paint color dated? If so, consider adding a fresh coat of neutral paint. The same applies to area rugs and carpeting. Be sure to have them professionally cleaned and, if dated, consider replacing. If you have hardwood floors under the carpeting, you’ll find it worthwhile to remove and refinish the floors to use the hardwoods as a selling-point. As for window treatments, remove any outdated or specific styles and replace. Or if you have great windows — make them stand out by removing all window treatments. fixtures with bright, cheerful accessories. It’s important that the home feel light and bright. Open the curtains wide (or replace as indicated above) and let in as much natural light as possible. Also, replace any light fixtures that are outdated and make sure all existing lights are working. We often suggest to our clients that they have a professional service clean the property from top to bottom including walls, ceilings, and baseboards. Dirt eats equity and the more your home shines the better for prospective buyers. Windows and mirrors should be free of fingerprints and hardwood floors should shine. Scrub bathrooms and kitchens so they sparkle. Don’t forget to dust lampshades and curtains. 1. Don’t be emotionally attached. As soon as your sellers makes the commitment to sell, they need to look at their end goal. Are they downsizing, moving to be near family, or a warmer climate? It’s important for them to emotionally detach from selling their home. Any negative remarks you gather as their real estate professional from home buyers, sellers need to be able to use as constructive criticism and be willing to do what it takes to get their “product” sold timely and for top dollar. 3. Don’t leave anything broken. Everything should function correctly and be in working order. Sellers need to make sure they repair leaky faucets, cracked windows, loose doorknobs, broken tile, and replace light bulbs that don’t work. kitchen a more modern appeal. Now is not the time to gut the kitchen with a complete makeover. Keep it to the essentials in giving the home a basic cosmetic fix. Painting goes a long way in providing a modern “facelift” to a home, including kitchen cabinets and bathroom vanities. 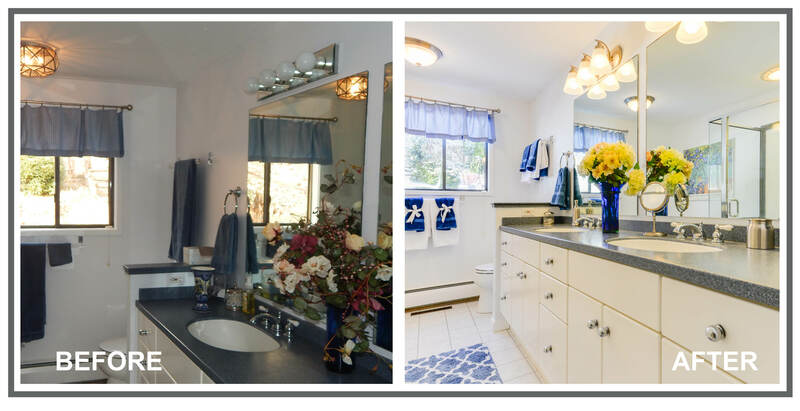 Updating a home by adding new flooring, if needed, a new bathroom vanity and light fixture, and making any necessary repairs will be worth the investment to get the house sold. 5. Don’t buy all new furniture. Rearrange and put away excessive pieces to simplify and make the room appear larger. Update or hide imperfections with new throws and pillows. However, if your sellers are already planning to purchase updated furniture for their new home, they may want to consider buying sooner for selling purposes too.